Christmas day is just around the corner. 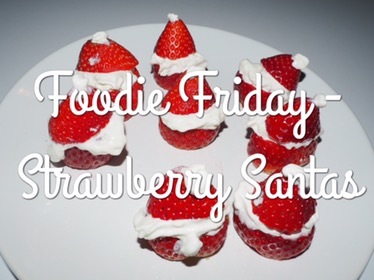 After a huge Christmas dinner you might not have room for much in the evening, but these super simple and quick to prepare Santa strawberries are the perfect sweet treat! I originally found this idea on Pinterest where they used cream cheese instead of squirty cream and to be honest I would recommend you do the same as although mine worked and were tasty, it would have been much better with something a little more solid as they did tend to slide apart easily! You can also use icing if you don’t like cream cheese.